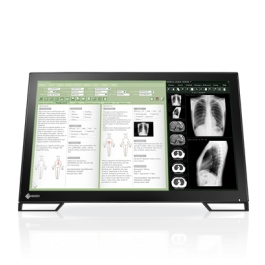 The monitor implements touch panel technology which accepts input from a touch pen. MS-models feature a DICOM preset mode whose grayscale tone is preset on the production line for optimum reviewing of medical images. 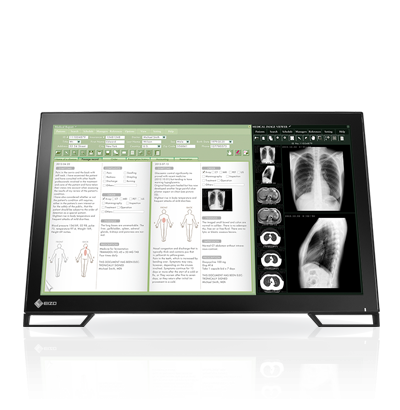 EIZO ScreenSlicer is a desktop monitor software utility that allows an entire screen to be effectively used through partitioning. Multiple windows can be easily aligned and dropped into the partitioned areas in single- or multi-monitor environments for convenience. Design with perfect flat top surfaces offers you touch operation all the way to the edge or corner of the display area without being obstructed by the bezel. Smooth surface also allows easy cleaning of dust and fingerprint attached to the front of the screen. By utilizing an energy-efficient LED as a backlight, the monitor achieves a high-brightness and low power consumption at the same time. Since the LED backlight is mercury free, it will reduce any potential impact on the environment when it is disposed of. The widescreen 16:9 aspect ratio provides significantly more horizontal space than the 5:4 aspect ratios of conventional square monitors. The screen is wide enough so that you can keep tool palettes open without covering the window you are working on. MS235WT comes with stands that let you tilt the monitor back ideal for touch pen use.